Artist Cecilia Danell, preparing for the opening of her exhibition, The Last Wilderness, in the Galway Arts Centre. Photography for this feature by Kernan Andrews. THE LAST Wilderness is set to be a milestone in the career of Galway based artist Cecilia Danell. Not only a major solo exhibition, opening in the Galway Arts Centre on Dominick Street, tomorrow evening, it will be the most extensive, and varied, display of work from this multi-talented creative to date. Cecilia is originally from Motala, on the eastern shore of Lake Vättern in southern Sweden. Her artistic talents were encouraged from a young age by her mother and grandmother, both of whom paint as a hobby. An early inspiration were the illustrations in Astrid Lindgren’s Pippi Långstrump (Pippi Longstocking ) books. By her teens, Cecilia was becoming keen on pursuing art as a career, and she had also become interested in Irish music - both trad and rock - which eventually led her to move to Ireland at 19. By 2004 she had enrolled at the GMIT Cluain Mhuire, and she credits Galway with the development of her distinctive style. “I don’t really paint the Irish landscape as I don’t think it’s my story to tell,” she says. 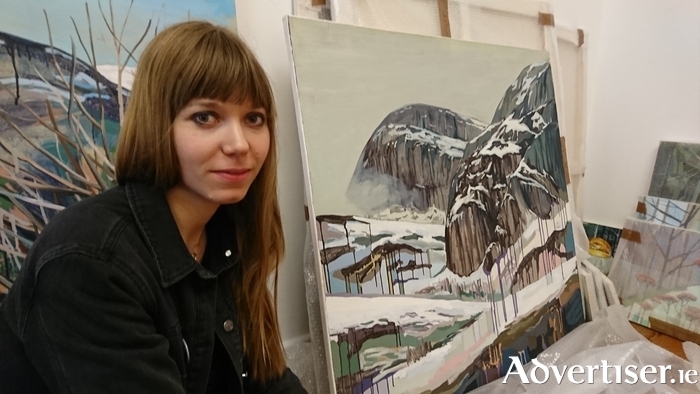 "There’s a long history of painting Galway, but I don’t have the same connection to it I have to the Swedish landscape. But I went to art college in Galway, Galway is where I developed my artistic practice, I have a studio in the city, and the fact is, my work might be very different had I not left Sweden." Wandering through the paintings on the arts centre's ground floor is to wander through the mountain wilderness of Norway, or its it? What may look like wild, untamed, nature, is deceptive, and this is a key theme of Cecilia’s exhibition - the sometimes blurred boundary between what is real and what is not. Cecilia’s paintings are not literal interpretations of the Norwegian landscape, but very personal reinterpretations born of both her experience of that landscape, and the methods by which she depicts it. This is encapsulated in the exhibition’s centrepiece, ‘This Blue Is Sky Wide’, a landscape dominated by a majestic mountain range, while below, felled logs and wooden boxes indicate people recently at work. Cecila’s use of colour is striking, but so too is the manner in which she deliberately allows paint to drip downwards on the canvass, abstracting the images, and drawing attention to how they are not as representational as they appear on first view. Arts Council funding made the diverse work possible. "It allowed me make something more ambitious for this show,” she says. One of the highlights could well be Tonight At The Magic Theatre, a Super 8 film animation by Cecilia, with a soundtrack by her friend Sophia Ek. It will be shown on a screen placed between fake trees made of wood. The film was shot in a community theatre, with animated objects moving about on the stage, and in a woodland, where the same objects also move about.